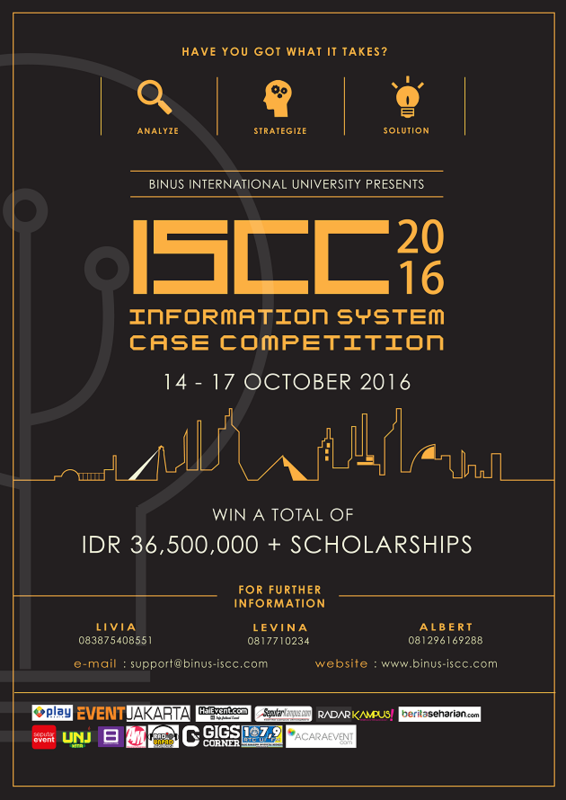 RADARKAMPUS.COM, Jakarta – Binus International University Presents ISCC 2016, The time of the year has come again! BiNus University International Association of Information Systems, or BASIS, is holding their yearly event, Information System Case Competition (ISCC). ISCC 2016 takes on the topic of “Internet of Things”. BASIS took the topic because in this globalization era, technological growth is high. Almost every day, a new technology is born. However, without people noticing, there are a lot of problems in this world that can be solved by using technologies. ISCC encourages young mind to solve a reallife problem using technology. ISCC is being held from 14 to 17 October 2016 in BiNus University International’s JWC campus, located in Jl. Hang Lekir I no IIIa. The participants will spend a night to build their solution in BiNus’ living place, BINUS Square, in Kemanggisan. The events will also have a seminar held by multiple companies and parties, that will also help create the case for the participants to solve. The participants will compete for prizes up to Rp. 37.500.000 in total. We are still open for registration! Join us now! For more information, please contact Levina Levina 0817710234 or Livia 083875408551.